This is probably one of the most unusual hotel rooms I have come across. 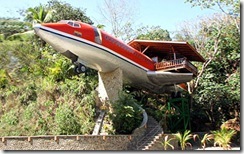 It is made to look like a crashed airliner and is situated in the jungle in Costa Rica (pictured left). 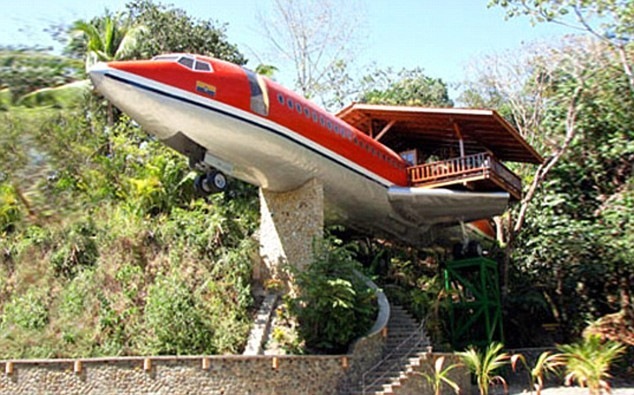 Whilst it looks like a plane in fact the inside is every bit as nice as a luxury hotel room and it is being marketed as the most exclusive hotel suite in Costa Rica. 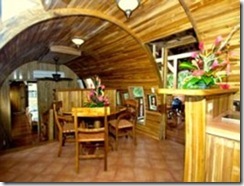 The two bedroom suite is inside the fuselage of a 1965 Boeing 727. It includes two wood panelled bedrooms (pictured right), a kitchenette, dining room (pictured below), living area and two bathrooms. It also has the advantage of offering spectacular views of the jungle from the balcony on the planes right wing. Apparently it is the perfect height to observe wildlife such as sloths, toucans and monkeys. It certainly an interesting idea. If you fancy staying there it costs between £200 and £250 per night. According to this article Ryanair are considering charging a fat tax for overweight passengers. The idea comes as a result of a competition on the companies website that gave customers the chance to win free flights by coming up with ideas to save the company money. Around 100,000 passengers took part in the competition and around 30,000 of those voted for a fee for overweight passengers. As a result Ryanair is now seriously considering implemented the idea. Other ideas included a charge for toilet paper with Mr O'Leary's face on it and the option to pay to use a smoking cubicle. It is not clear whether either of these ideas will be implemented. Rail fares are to rise by up to 11% next month with those customers who book in advance paying the highest increases. National Express East Coast is putting up its prices for the second time in five months. In January it raised unregulated fares by 7.4% and the further increase will mean an extra 11% on some advance purchase tickets. The First Great Western, East Midlands Train, First Capital Connect and CrossCountry companies are also increasing some fares. All of the rises are on unregulated fares which does not include season tickets. The prices of these must be decided linked to the retail price index. It is likely that train companies will not be allowed to increase these regulated fares next year so instead it appears they are increasing the costs of their unregulated fares. The move means that some fares will have jumped 16% in just five months. This article suggests that United Airlines may bump obese passengers on overbooked flights. The airline received more than 700 complaints last year regarding overweight passengers. At a time when two thirds of Americans are considered overweight the airline may target customers that are too big to fit into their seats. Under the new rules a passenger who is too large for their seat will be moved to two empty seats at no extra charge. However, if no seats are available as is often the case on overbooked flights the passenger will have to pay to upgrade to a larger business class seat or will be bumped off the flight and will have to pay for two seats on the next available departure. The airline has adopted the policy because it has received so many complaints from passengers who felt cramped by oversized seat mates. 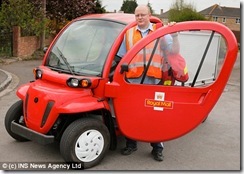 According to this article the local postman could soon be delivering the mail in a new egg shaped buggy. The vehicle which has a top speed of just 25mph is being trialled in two areas in Oxford and Essex. If the trial proves successful the vehicles could replace the current fleet of diesel Vauxhall vans. The electric vehicles whilst slower than the diesel alternative are more environmentally friendly and could potentially be used on town deliveries although the lack of speed is likely to mean they are unsuitable for rural routes. I find the idea interesting but I do wonder how it would work in practice when postman are under pressure to complete their rounds in a set amount of time, surely a slower means of transport will mean that all of these time limits will need to be revised. PC2Paper prices for UK and international mail sent from the UK will increase from the 6th of April. This is due to Royal Mail prices increases which come into effect on the same day and mean that we need to pass these increases onto our customers.